It makes for a good story, especially since he is now an assistant professor with the economics department at the Walton College, a position he began in August 2018. He was fulfilling a requirement for all South Korean males to either serve a stint in the military or in a suitable alternative government role. While fire station responders were responsible for extinguishing fires and performing rescues, Jung says his job was actually mundane. Yes, there were calls to get cats down from trees and to remove the occasional bee hive that took up residence in a homestead. Yet there was one distress call that outnumbered them all: people getting locked out of their homes or cars. “The majority of the job was to open the door,” he says. After another college stint – one where he studied film before abandoning the idea of working in cinema – he worked as deputy director of Korea’s Ministry of Land and Transport. There, Jung designed an open-access competition policy for Korea’s railway market and launched a government investment fund. The experience of working in a government job opened his eyes to public policy. It was a good job, but there was a problem. “It was extremely hard to make balance between family and work,” he says. My family consists of: my wife and two kids, a daughter and son, ages 5 and 3. When I was a child, I wanted to grow up to be a: scientist. If I could choose anyone to have dinner with, I would choose: my family. A routine I look forward to each day is: swimming. Jung left his job in Korea and moved to New York to attend Syracuse University, where he earned a master’s degree in public administration followed by a Ph.D. in economics. Raised in Gwangju, South Korea, Jung says he had no knowledge of Arkansas, and he and his wife didn’t know what to expect by coming here. But when they did, they found Fayetteville to be the ideal place to raise their young daughter and son. In fact, he says they were delighted to learn that there were other faculty members with children similar in age to theirs. 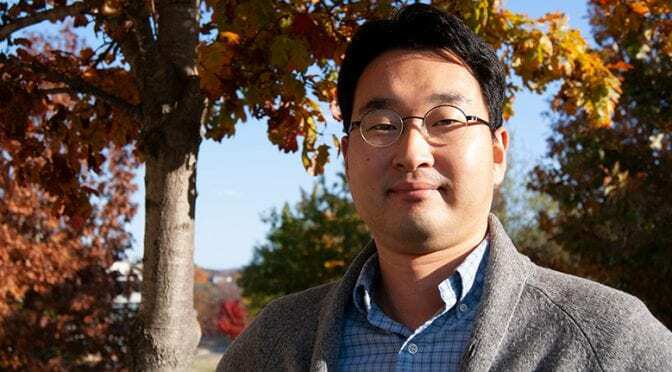 Jung says the collegiality among Walton faculty is evident, and he is impressed by the environment conducive to collaboration, noting that turnover is low – an indication that faculty are content. He says it’s not like that everywhere. “Here, they’re like family,” he says. This spring, Jung will begin teaching Introduction to Econometrics to both undergraduates and graduates as well as Econometrics II, a graduate course. In his public policy research, Jung has studied connections, if any, between police officer experiences and their racial biases in traffic stops. His research has also included studying managerial efficiency, such as how a manager’s selection of workers affects team performance. Now that he’s among Walton faculty, with fire station obligations long over, he has retained at least one skill he can use for the rest of his life: He knows how to perform CPR.